I adored this book when I was little. I installments to the kids before bed last year and they adored this book as well. It is well worthy of adoration. I am not as crazy about this particular cover. I am thinking about getting this edition. Just because it is prettier. This is written by the Julie Andrews. The Mary Poppins and Maria Julie Andrews. Often when some one famous writes a book, they are coasting a little too heavily on their name. But this book is legitimate. It would still be a beloved book if it was written by a nobody. Mandy, a ten year old orphan lives in a nice orphanage with nice people. Loving to be alone, she spends her spare time outside, She was rarely lonely at these times. The trees and flowers were very special to her and she knew the names of most of them by heart. However, all was not hearts and flowers. She occasionally experienced very disturbing feelings. Sometimes she felt an ache inside that would not go away. It seemed then as though her life were very empty. Her attempts to keep busy were mostly an effort to fill her life so that she had not time to feel disconsolate. But the nagging sadness was persistent and it would envelop her when she least expected it. As Mandy grew, her longings grew stronger and sometimes she felt as though she must surely break apart with so much going on inside her. It was as though she were searching for something, though what or where it was she could not say. In her wanderings, Mandy discovers a little, abandoned cottage on the property next to the orphanage. 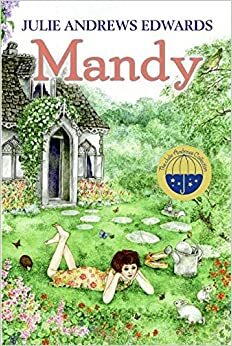 In The Secret Garden style, Mandy takes the cottage for her own. For her own little place in the world. She pours her energy, her spare time, and her lack of family into making this her very own little house. Inevitably, questions arise--Where is Mandy for hours on end when no one can find her? Where are small things around the orphanage disappearing to? In an effort to protect her precious secret, Mandy lies, steals, and loses friends. But oh! your sympathies are entirely with her. Even when you cringe and think "Oh Mandy, don't do that." you understand exactly what is motivating her and have a sneaking suspicion in your inner soul that you might behave just like Mandy in the same circumstance. Her longing to belong, to have a family, and a place of her own are so real. Those feelings are so well communicated through the book that the absolute joy of the ending, when she finds her place in the world is incredible. I cried, my kids cried. This is one of Lillian's little wee watermelon (?) plants that just sprouted. The illustrations are sparing, but just plentiful enough to supply an adequate backdrop to imagination. Mandy climbing over the wall for the first time. Cleaning the marvelous Shell Room in her wee cottage. The times when Mandy is at the cottage are little osasis of calm and joy. She plants the flower beds with dear, old fashioned flowers. She scrubs the cottage to a fair-the-well. She makes and executes so many plans for her little house. I yearned for my own little cottage to take care of. Being reprimanded by kind-hearted Matron. Matron knows Mandy has a secret and since she loves Mandy, she doesn't want to force it out of her, but she is also worried about what the secret might be. With the loss of some semi-valuable garden shears from the orphanage's gardening shed, Mandy is punished by the withholding of her wages from the little general store until the shears are paid for. And finally, the climatic ending. As the summer progressed and fall started, Mandy started realizing someone else knew about the cottage. Footprints and then little notes and presents from An Admirer. When Mandy gets sick and is bedridden, she can't bear the thought of her little cottage being lonely or her admirer not knowing where she is. So she feverishly climbs the wall again. The exertion leaves her unconscious on the floor of the cottage. Having finally told her friend about the cottage saves Mandy's life, since the friend can direct Matron to the cottage. Mandy is brought to the Manor house, since it is closest, and at the manor house, in the midst of a family, Mandy finally starts to understand her place in the world. If you have not read this book. Do it now! You will be glad you did!